The pair of episodes “Mercy Mission” and “Nomad Droids” really stand out as different from the rest of the season. Threepio and Artoo have been the glue that binds the saga of Anakin Skywalker together, yet with these episodes they were sent on their own adventures. People seemed to either really love or hate these episodes; which side of that battle line did you fall? Lex: I loved them. A little bit of silliness with the droids has always been a part of Star Wars ever since their first scenes at the beginning of A New Hope, and a few minutes after that their wacky little side adventure on Tatooine wandering in the desert and getting abducted by Jawas. I thought these episodes were very much in the spirit of that. 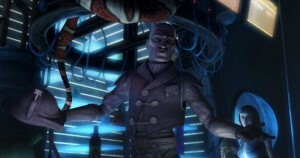 And there’s plenty of serious, emotionally intense content in TCW as it is. Some lighthearted episodes are a good mix. Megan: There are jokes I like in those episodes, although mostly they seem targeted to adults (such as the Lilliputians’ savage reply to C-3PO declaring them democratic.) The droid adventures definitely do have some of the spirit of the original series in them, but in the original series the droids tended to forward the plot in some way. I didn’t think they were necessary in The Clone Wars. The Wizard of Oz references were distracting rather than entertaining. Tricia: Individually I enjoyed them both, for the homages and what they were trying to do as far as test their storytelling. I loved having the droids move through a battle, but seeing if from their perspective, with blaster fire and Jedi moving around them, as opposed to the other way around. I was fascinated by the three stories in three acts of “Nomad Droids”; it’s different and changed things up. I like when storytellers try new things or test the waters. I know for some though the dip into the fantastical seemed far-fetched. I’m not so sure you can say something is far-fetched when we accept the Force, visions of the future, healing powers and the likes. I think people have a comfort zone with their Star Wars and sometimes a long-running show is going to push fans out of that comfort zone. 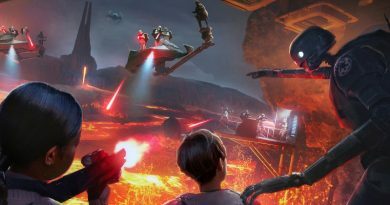 With that said, for the side-adventure with the droids I think they should have picked one episode. The Umbara arc, featuring Rex, is the strongest representation of the season’s tagline. While I would like to see more development of some of the major players, I get the impression they were trying to make Rex a major player. His fate, and Ahsoka’s, are the great unknowns of The Clone Wars, so this seemed like a determined step to establish his role. Do you think they accomplished what they set out to do? Lex: By the end of the arc, Rex really symbolizes the conflict within the entire 501st legion. On one end you have clones like Dogma and Appo, who are going to follow orders basically no matter what. On the other end there’s Fives, who thinks for himself and doesn’t appreciate just being a disposable chess piece on the board. Rex isn’t just torn by having to manage that tension within his ranks – he’s also struggling with his own feelings pulling him in both directions. Rex has really become a fully developed character in his own right, far more than just the clone captain who tags along with Anakin and Ahsoka to help them carry out their missions. Megan: Rex has a big fandom, although I personally am more interested in the clones’ group dynamic rather than an individual. We know that he’s affiliated with the 501st, who will eventually aid Darth Vader in sacking the Jedi Temple. And, as a leader, his development affects the development of all the clones who felt conflicted during the conflict with Krell. I think Rex is a good vehicle to convey the clone perspective. Tricia: I’m amazed at what they pulled off in this arc, not just for Rex, but several clones. Through Rex’s story, we see the humanity blossom around him. I found it really interesting that Anakin’s determination to save his friends, his compassion for the individual, which is what the Jedi have tried to train out of him, is what inspires the clones as individuals. There’s an ongoing theme of balance in Star Wars, not just between good and evil, but between being dogmatic and flexible, doing the right thing because it is the right thing not because you’ve been told it’s the right thing. The Umbaran arc really fleshed this idea out using the clones as the focal point. Fan response to General Krell was varied. Some worried he’d be the villain-of-the week or yet another Sith in the fray. 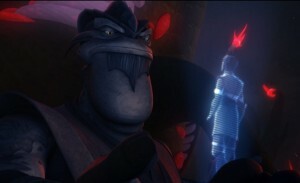 Others liked how his character seemed to encapsulate the moral dilemma the war has created within the Jedi Order itself. What did you think of Krell’s role in the arc? Lex: I thought the episodes did a good job of keeping us wondering through most of the arc, then finally giving some answers at the end. I’m glad that Krell wasn’t just a minion of Sidious already turned to serve the Sith cause. It makes sense to me that many powerful Jedi would be sensing the disruptions in the Force, maybe even anticipating the rising darkness, and that some of them would turn their backs on their training and decide to save themselves by joining the winning team. That’s the beauty of the Sith plan – the Jedi can’t win; they lose the war simply by fighting. Megan: I loved the Krell arc: it really explored the morality of The Clone Wars and the Jedi Order, and there was a lot of mystery. But I was a bit disappointed that Krell was revealed to have turned to the dark side. 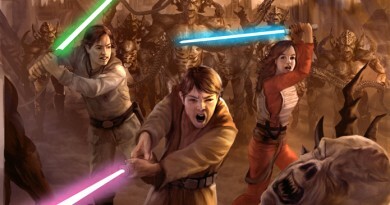 These episodes could have been a great opportunity to show the difference between “turning to the dark side” and “putting your troops in danger because, as a light-side Jedi, you value the light side more than individual lives.” Dave Filoni has stated that the war makes the Jedi lose themselves just by fighting it, and I think that could have been shown in a more subtle way. But the Krell arc was one of my favorite parts in the season. 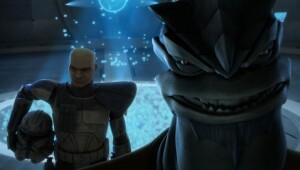 Tricia: Jedi General Krell fascinated me. He’s not human and we don’t know a lot about his species. So it’s hard to say if this survival instinct was part of his nature. Even putting that aside, war does strange things to the mind and the Jedi have had attachment to the individual trained out of them from the moment they are removed from their families as younglings. The clones became just pieces and the war only about winning. This is apparent time and again as we see snippets of the Jedi Council meetings. Krell epitomizes the moral slope that the Jedi have found themselves upon. The Slaves of the Republic arc is based on a comic of the same name by Season One head writer Henry Gilroy, who came back to adapt the arc for television. They made some changes, including addressing the slave attire for Ahsoka that had caused some controversy back when it was first released. 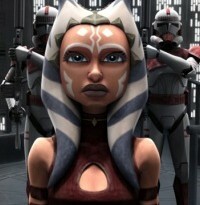 The Clone Wars has improved many things about the portrayal of female characters, but I think it could be better. What did you think of the changes made in this episode and overall how the season dealt with these issues? Lex: I reread the comic shortly before the episodes aired, so I had the longer version of the story in mind as I watched. They had to cut some elements and shorten some things, obviously, but I thought the three episodes did a great job of keeping all of the key aspects of the story that made it powerful for the characters. In terms of female characters, I thought both Ahsoka and Ventress were given some great development this season. 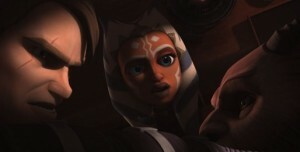 Ahsoka is growing into the role of a strong Jedi Knight, while Ventress was forced to reevaluate her self-identity several times over. I would have liked to see more of Padmé, but she had a singularly great moment in “Shadow Warrior” – when she agrees to trade the captured Anakin for the captured Grievous – that really shows her common touchstone with Anakin that protecting loved ones trumps just about everything else. Megan: The slave attire in these episodes was both less revealing and more brightly-colored than the version in the comic, both of which seemed to me to be more appropriate for an all-ages audience. (“More appropriate” still didn’t mean I was happy with Ahsoka being placed in the slave Leia role, though; it felt very gimmicky.) The season as a whole showed more focus on and development of female characters than The Clone Wars has before, especially in regards to Asajj Ventress. My final word on the Ahsoka controversy is that there wasn’t enough fannish outcry, but I can also appreciate that there were a lot of moral questions raised in this episode that would enable parents to open up discussions with kids. Tricia: Megan brings up an interesting point that merits discussion. 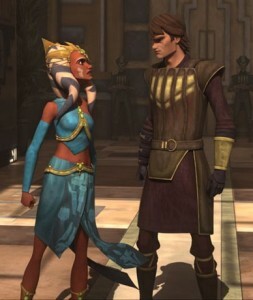 In the original Slaves of the Republic comic, Ahsoka was marginalized by her costume, and the topic was discussed by fans. 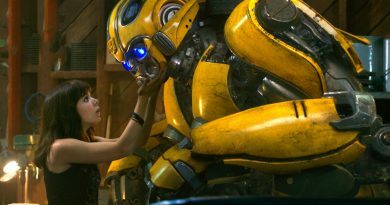 Sometimes though the more important point, whether a female character is marginalized by her story arc, is lost. A costume is often just a moment in time and needs to be considered relative to what the storyteller is trying to say about the character or story itself. The three-part arc certainly improves the storytelling position for Ahsoka from where it was in the comics. Still I wanted to see more for Ahsoka and Padmé, who flitted around on the periphery of a season that gave a lot more time to its male heroes and villains. Asajj, by far, received the best effort at fleshing out a strong female character. Dave Filoni has discussed that Bo Katan will have a beefier role next season. She, like the Nightsisters, create more cosplay opportunities for the female fans and that’s been brought up specifically in interviews about this season. That highlights the way I felt about the season overall, that it provided new costumes for convention time, new character models, revisited some older characters from the movies and constantly wowed us with the ever-improving slate of special effects, all superficial elements, but that it didn’t measure up substantively, particularly where the female characters were concerned. The television arc really focused on Anakin and how slavery has affected him as a Jedi. How do you see this arc tying into what we know will happen in Revenge of the Sith? Lex: Anakin’s vulnerability to threats against his loved ones really shows up in this arc, with the way the queen treats Obi-Wan and Ahsoka. If he knew he could have saved them easily, he’d have killed her for endangering them; the only thing that makes him be a little bit patient is knowing that he needs to keep her alive to protect them. (Sounds familiar.) I also really liked the scene of Ahsoka serenely meditating in the hanging cage, at peace with knowing that the Force will guide her with when and how to turn the tide against her captors. Very much the opposite of her Master’s reaction to their predicament. Megan: The most obvious parallel to me is Anakin’s attempt at Force-choking the Zygerrian queen. Like Lex said, Anakin has strong protective instincts that he feels are most easily served by the dark side. However, the dialogue didn’t touch on the idea that Anakin might come to see the light side as a form of slavery, and that always seemed to me to be the most clear connection between The Phantom Menace Anakin, who goes from calling Watto “master” to calling Obi-Wan “master,” and the Revenge of the Sith Anakin who tries to take control of his own destiny through the dark side. The potential for a clear connection was there but the writing didn’t quite make it show. The comic had a powerful arc for Obi-Wan. While in captivity he faced tough dilemmas about what it meant to be a Jedi and, at least it seemed to me, revealed the Ben Kenobi who persisted for almost two decades guarding Luke. A lot more of the character development for Obi-Wan this season took place in the Bounty Hunters arc. Did Obi-Wan’s time as Rako Hardeen make sense? Lex: I think there’s a real contrast between these two arcs for Obi-Wan. In the Zygerria arc, we see the immensely patient Jedi Master who is willing to suffer greatly personally to do what’s right – in this case, to keep the other prisoners from retaliation at the hands of their captors. In the Hardeen arc, on the other hand, Obi-Wan gives his assent to the morally compromised maneuverings of the Clone Wars era Jedi Council. He knows they should have told Anakin the truth, but he’s willing to hurt his best friend deeply just for the slim advantage of “selling” his death just a bit more convincingly. In his willingness to do that, we see the seeds of the Obi-Wan who’s willing to ask Anakin to spy on the Chancellor in Episode III. Megan: I think both of those arcs do show how Obi-Wan’s traits remain consistent into the original trilogy. Obi-Wan also believes keeping Anakin’s identity secret from Luke will keep the younger Skywalker safe. Obi-Wan’s intense loyalty to the Council – or to whomever he perceives as the moral high ground – always remains consistent. I liked that the episodes with Rako Hardeen made him have to fight to hold that ground. This concludes our second part of The Clone Wars discussion. We’ll be back in a week or so with “A Friend in Need” and lots of talk of bounty hunters. I really liked your look at the middle part of the season. I especially liked your thoughts on Kenobi and his struggles though out the season; getting beat up all the time and trying to walk the line of morality. To me, it makes his character the best of the saga. His struggles this season also link the season well to what Rex goes through on Umbria; do you follow orders when you clearly know the orders are wrong? Really good stuff. Just hoping to see more Jedi in season 5 and I don’t just mean Ben, Anakin and Ahsoka; hoping to see more Mace, Aayla and the others!